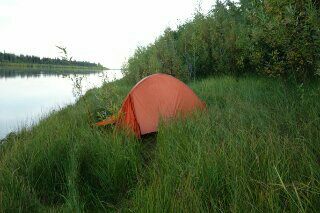 There is no space to pitch the tent, on the island, and on the mainland. Furthermore, it is difficult even to find a place to pull up kayak on a shore. Searching a lot, finally I found a tiny damp ground. Since there was no space to pull up the kayak above a water, I just moored the kayak floating on the water by rope. Pulling stuffs out from kayak was difficult, a dinner was only bread and dry salmon. The zipper of the tent fly that I had squashed the slider of it already became not to be closed. I squashed it again. I do not know how long this repetition will work.